Using the Morphology G3 microscope you can determine the sizes of the particles in a powder, just as when using a normal microscope. However, this instrument has some large advantages compared to manual microscopy, both in relation to the larger number of particles included in the analysis – and the possibilities of looking at special characteristics, which might be highly valuable for optimizing the manufacturing process. In this post, we present two cases: The first case shows that an excellent correlation between particle sizes determined on Morphology G3 and by laser diffraction can be obtained. The second case is meant as inspiration, where the possibilities for examining powders in mixtures are presented. A powder sample has been analysed: Using the dispersion unit, which is an integrated part of the instrument, the sample powder was dispersed onto a glass plate. Overall, almost 200.000 particles were following analysed and a separate picture was recorded of each particle! The first graph shows the analysis of all particles in the sample. A main peak is observed – and to the right of this peak, additional “uneven peaks” suggest that several larger particles are also present in the mixture. As one picture is recorded of each separate particle in the mixture, it was easily observed, that the main fraction of these large particles were fibres . These fibres can be regarded as impurities, and are not relevant for the analysis. Further, it was observed, that a number of the particles were agglomerated, i.e. more particles are attached to each other. In this analysis, these agglomerates are not relevant either. In order to exclude these particles from the analysis, a filter was chosen: Only particles with convexity > 0.94 were included in the analysis. 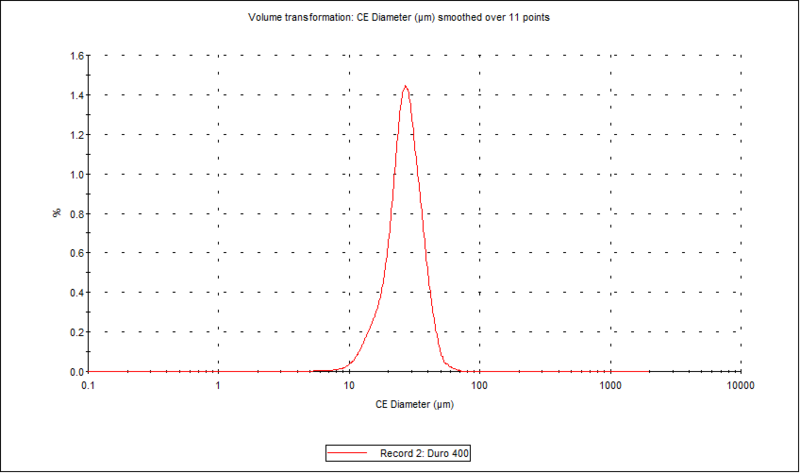 This simple filter led to exclusion of particles like the ones shown the above figure – and the overall particle distribution, when excluding these particles, are seen in the figure below: Now the particle size distribution is very smooth: Only one peak is observed, and the fraction of the apparently large particles has disappeared. 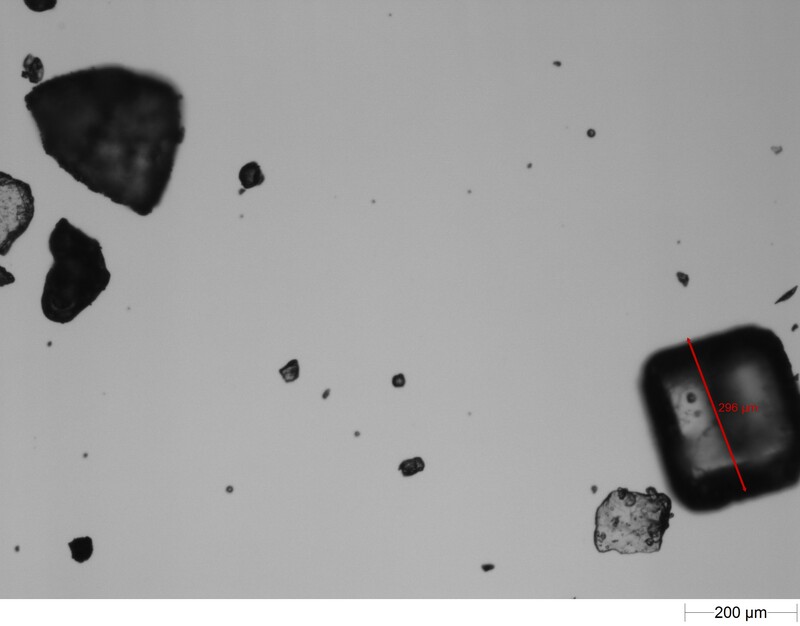 For this sample, this particle size distribution can be regarded as a “correct” picture of the primary particles in the sample. As we have often stated, there is no true particle size, at the size depends on how you analyse the particles. Thus, the results from laser diffraction is not expected to be identical to the results from microscopy. However, for the major part of particles, an agreement in sizes are expected (read more). 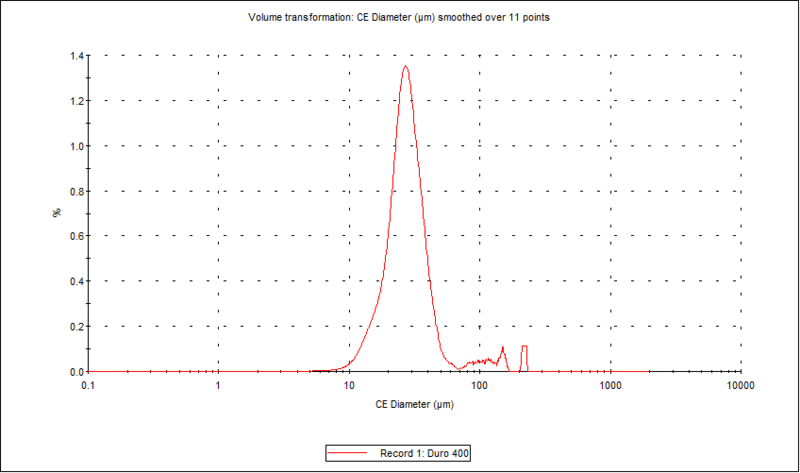 Thus, the same powder was analysed using laser diffraction. As seen in the table below, the correlation between results is excellent: The measured values for D90% using Morphology G3 is around 39.5 µm, whereas the same value on laser diffraction is around 36.3 µm. A better correlation cannot be expected using these two type of equipment having very different modes of action, thus the outcome must be said to be very good! Normally Morphology G3 is an instrument used for analyzing particle sizes of pharmaceuticals and excipients. In current experiment, in order to illustrate the possibilities, powders were found in the kitchen drawer: Suger, salt, coffee creamer and cocoa. However, the same experiments could be performed for a pharmaceutical tablet mixture, for instance for testing homogeneity and particles sizes of a mixture before pressing a tablet. In the initial experiment, microscopy pictures were recorded of each of the materials alone. These are seen in the following pictures: The pictures show clear differences between the materials with regard to shape and sizes. Coffee creamer: Consists of particles with varying sizes. Overall the particles are edged and have a high intensity (i.e. dark) . Broad size distribution. Sugar. Square particles with well defined edges. Narrow size distribution: Almost all particles are of same size with a diameter of around 500 µm. NaCl. Square particles with well defined edges. Narrow size distribution: Most particles are of same size with a diameter of around 200 µm, however some smaller particles present. A mixture of these four powders were prepared . The mixture were transferred to the disperser on the instrument, and automatically dispersed onto a glass plate. One of the main advantages of the instrument is that a large number of particles can be characterised very fast with regard to size and shape – and the possibilities with regard to data analysis is tremendous. 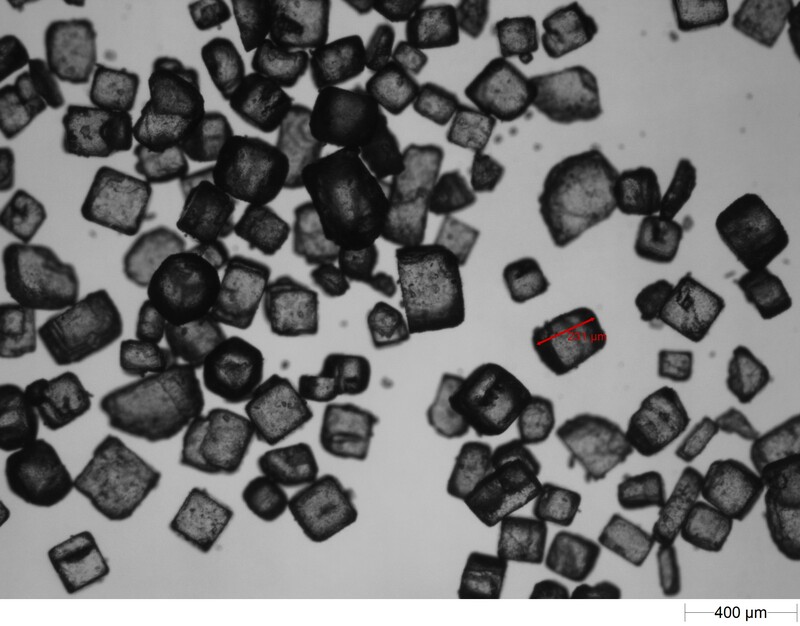 A picture of the dispersed mixture is seen below: In this picture, representing a very small fraction of the total number of particles counted (around 100.000 counted in total), the different particles are observed: The square particle, originating from sugar or salt (most likely salt, as the sugar particles are larger), the uneven (darker) particles originating from the coffee creamer and the small particles originating from cocoa. In Figure 2, a screen shot from the instrument after the analysis is seen: In the graphs to the left, the overall particle size distribution of all particles are shown in “different versions” – and to the right, pictures of the individual particles are seen (only a single sugar particle is seen on this screen shot). You can get a “normal” particle size distribution, by selecting particle size diameter in µm, i.e. d10, d50 and d90. This way of representing the result is very useful when microscopy is used supplementary to, for instance, a laser diffraction experiment. 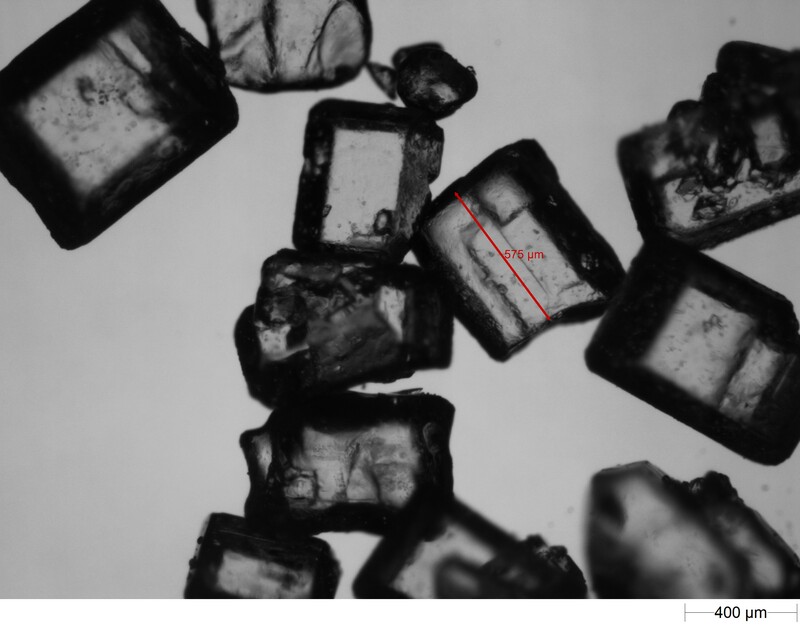 Thus, the microscopy results are very often used for confirming the particle sizes obtained from other “indirect” measuring methods such as laser diffraction (read more). However, the size in diameter might not be the most relevant parameter in your case – it might, for instance, be more interesting to know if some specific particles agglomerate in the mixture. In the analysis, a separate picture has been recorded for each of the particles, i.e. in this case pictures have been recorded of around 100.000 particles . An example of a fraction of the particles is shown below. 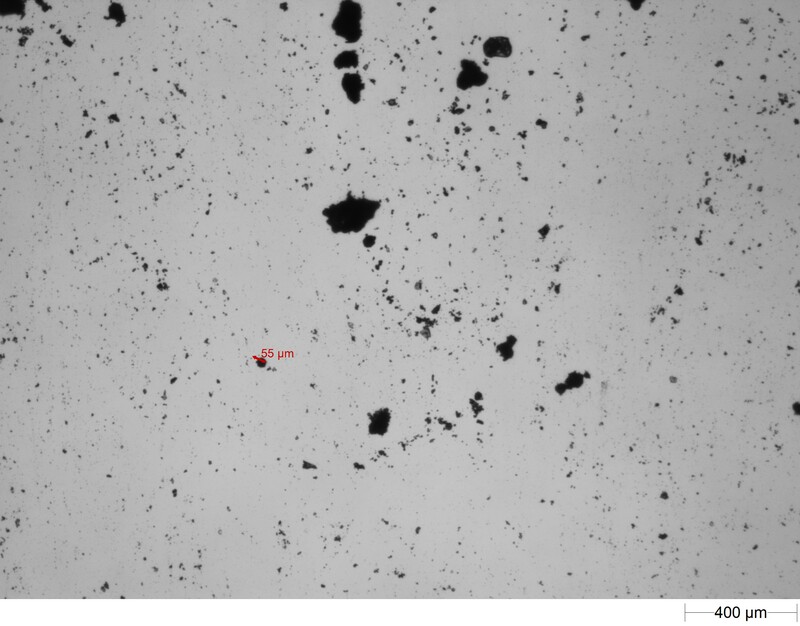 Note: In some of the pictures, two particles are seen in the same frame: The instrument is not able to differentiate between single particles and agglomerates. In present case, the method has not been optimised to secure a perfect dispersion – selecting the optimal pressure and sample amount would be part of a method development, which has not been performed in this case. 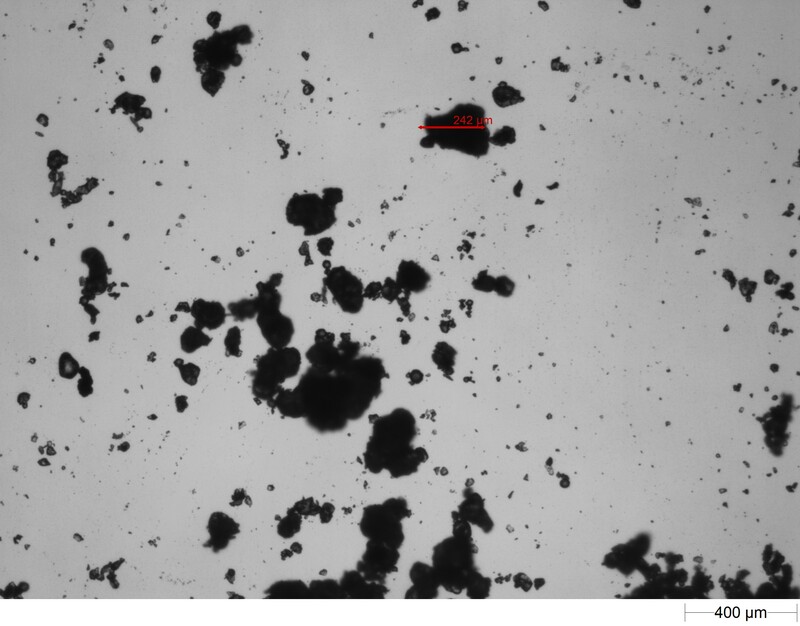 However, in cases where you are interested in agglomeration, you can sort the particles based on this (the agglomerates might have a higher intensity or be elongated compared to single particles). The picture shows a fraction of particles of same size (diameter) – thus all these particles have a diameter around 270 µm. These particles are mainly salt (square particles) and coffee creamer (darker particles with uneven edges). By analysing the particles by using different characteristics, for instance by sorting them by intensity, it is possible to separate salt from coffee creamer in the mixture, as clear differences in the intensity (color) is observed. When this first differentiation has been made, a filter based on intensity can be applied, and in the optimal case, the particle size distribution of only the coffee creamer in the mixture can be made. The results can be reported almost “as you wish”: According to diameter, elongation, intensity, circularity and so on. Thus, the analysis can be set up in order to analyse the particles with regard the specific properties that you are interested in. If you are interested in only looking a fibers, analysis with regard to elongation might be optimal – if you are interested in looking a special properties with regard to shape, circularity might be the most relevant. The present example is just an example of the possibilities. However, it should be noted, that for complex mixtures, method development takes time as it requires training to set up the correct filters for your purpose. In most cases, the instrument will “just” be used for determination of particle sizes in pure materials. 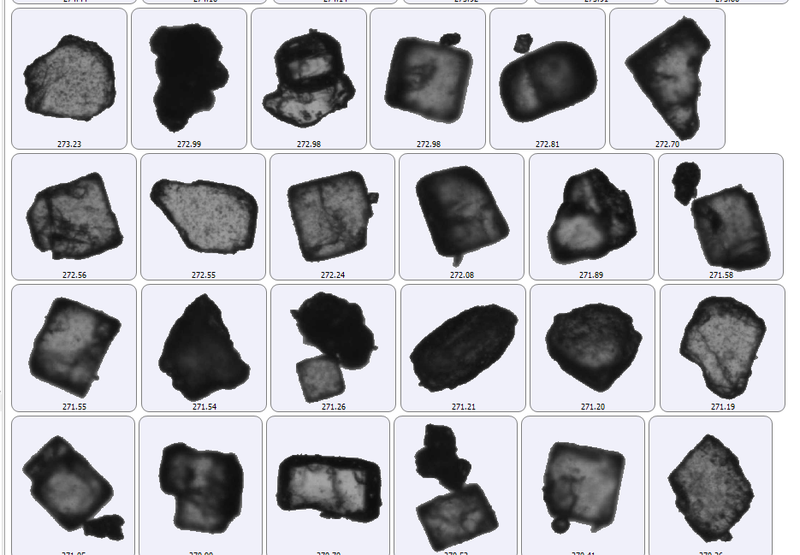 Especially for comparison of particle characteristics of different batches of the same material, this type of microscopy analysis is brilliant, as even small changes in morphological properties will be detected. More information about these possibilities to be published soon. What would be relevant in your case? Please contact us using the contact form if you have “particle issues” that our new instrument can help you solve.